The system is designed primarily to help the driver (and car) avoid collisions in circumstances where braking alone won’t be sufficient. In the same way that we didn’t go straight from landline phones to smartphones, there are likewise going to be some intermediate steps between today’s manually-driven cars and tomorrow’s fully self-driving models. We’re already seeing some of those steps starting to pop up, in the form of things like Cadillac’s Super Cruise control, Volkswagen’s Temporary Auto Pilot, and Volvo’s traffic jam assistance system. Nissan’s latest contribution is its recently-announced Autonomous Emergency Steering System. Cars using the system would be equipped with front-mounted radar and a video camera, two left and right rear radars, and five laser scanners mounted around the vehicle – this combination would give it a 360-degree view of its surroundings. Using output from these, the system’s Electronic Control Unit (ECU) would identify situations in which a collision was imminent. 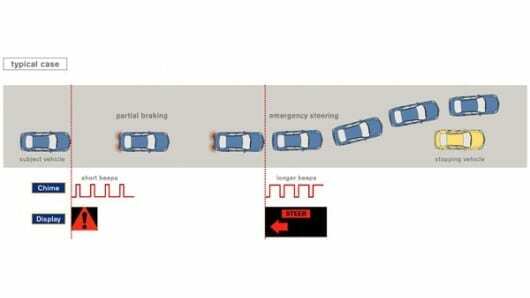 If that collision could be avoided by braking, the ECU would first warn the driver of the impending danger, and then proceed to apply the brakes if the driver failed to do so themselves. In some situations, however, the ECU might decide that braking alone wouldn’t be enough. In those cases, it would proceed to check for vehicles approaching from the rear, and for forward zones that were free of obstacles such as other vehicles or pedestrians. It would subsequently alert the driver with a series of audible beeps, and a visual display that indicated the direction in which the vehicle should be steered. If the driver didn’t react immediately by steering in that direction, the system would take over and do the steering itself.